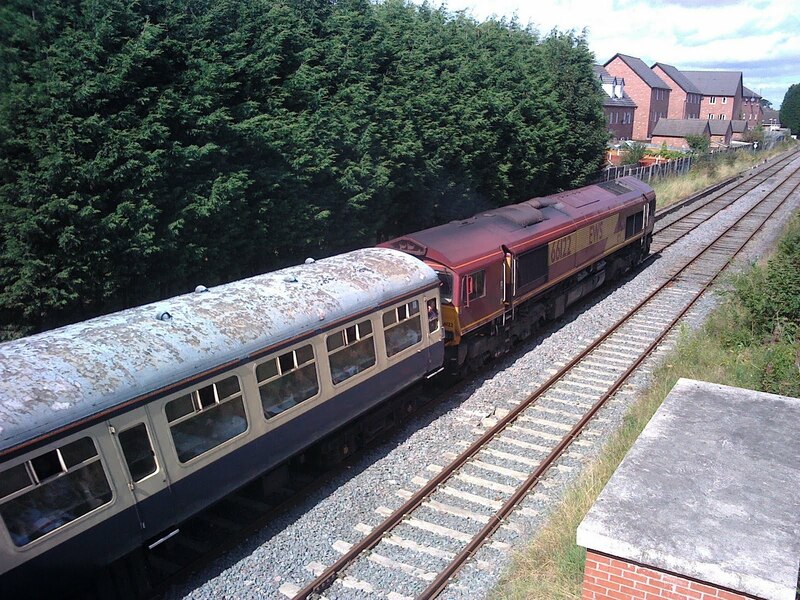 The 'Limestone Cowboy', an enthusiast's special from London Euston to the limestone country around Buxton, passes through sunny Middlewich at around 11.30am on Saturday 20th August 2011 and is seen here in this 'going away' shot by Vernon Perkins passing the site of the old station. It will continue along the Middlewich loop until it passes under the King Street bridge where it will regain the single track to Northwich. The Middlewich line is very popular with such specials, falling as it does under the category of 'forgotten tracks' (although MRLC has done its best to make sure this particular line doesn't stay forgotten for very long). The locomotive will soon be directly opposite the site of the old signal box where Peter Cox and I once staged a comeback for the old signal box sign. See this posting. Note the immaculate state of the track, which was renewed a few years ago, and the square brick building to the right which houses equipment associated with the elaborate signalling system now controlled from Manchester South. This building can also be seen here.